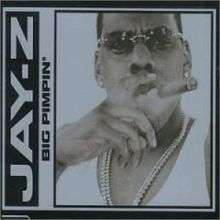 "Big Pimpin'" is the fifth and final single from rapper Jay-Z's fourth album Vol. 3... Life and Times of S. Carter. It features rapping by Southern hip hop group UGK as well as production by Timbaland. This latest lawsuit follows an August (2007) decision by a California judge to dismiss another lawsuit by Ahab Joseph Nafal, who claimed Big Pimpin' infringed the copyright on Khosara Khorasa. Lawyers for EMI Records argued the 50-year-old track was governed by the 1909 Copyright Act, AllHipHop.com reports. The music video was shot in Trinidad during its Carnival and features Jay-Z and UGK on a music truck dispensing money into the crowd and partying on a lavish yacht. It features hip hop model Melyssa Ford. It was directed by Hype Williams. The music video for Lonely Island's I'm on a Boat is largely a parody of this video. ↑ Jurgensen, John (2010-10-21). "Just Asking - Decoding Jay-Z". The Wall Street Journal. Retrieved 2011-06-13. ↑ "Gyp the System". Wayneandwax.com. 2007-09-12. Retrieved 2012-06-13. ↑ Nolan Strong (2007-09-04). "Rappers Jay-Z, Timbaland Sued Over 'Big Pimpin' Melody". Allhiphop.com. Archived from the original on 2011-09-19. Retrieved 2012-06-13. ↑ "Music Video Clichés No.3 - Boats N' Hoes - NME Video Blog - NME.COM - The world's fastest music news service, music videos, interviews, photos and free stuff to win". Nme.Com. Retrieved 2012-02-24. ↑ "Jay-Z - Big Pimpin'". Chart Stats. 2000-06-24. Retrieved 2012-01-16. ↑ "Billboard Top 100 - 2000". Archived from the original on 2009-03-04. Retrieved 2010-08-31. "The Game Belongs to Me"
"International Player's Anthem (I Choose You)"